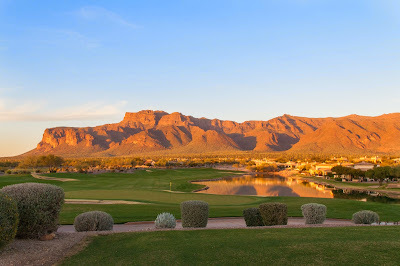 Superstition Mountain was established in 1998 by developer Lyle Anderson, who had a long lasting partnership with Jack Nicklaus developing notable Golf Course communities such as Desert Highlands, Desert Mountain, Las Campanas and now Superstition Mountain. We are near Apache Junction AZ about 38 miles east of Sky Harbor airport but much closer to Mesa Gateway airport which is a new feeder airport for the greater Phoenix area. There are two golf courses here, Prospector and Lost Gold. It is private now, as it was at its inception, but a few years ago it was hit by the recession and had to allow public play to stay afloat. Seven years ago it was purchased by Susan Hladky and on January 1, 2014 it returned to being a successful private club with over 420 members currently, and back to its old glory. The Tuscan clubhouse warmly welcomes you on arrival and the practice facility is as good and expansive as any I have seen with a vast driving range and a wonderful short game area. Its an appropriate opening to such a club that boasts Mike Malaska, the 2011 National PGA teacher of the year, as head of instruction. If you want to improve your game, this is as good a place to do that as any. Before we started our round Nic DiLucci the head golf professional cautioned us about reading the greens. “They are running almost 12.5 today (about the same as Augusta) and ran over 14 on the stimpmeter when we hosted the Arizona Open”. He also suggested we pay attention to the mountain nearby. Downhill putts may appear up hill and vice versa. We weren’t more than a couple holes into the round and we were very thankful for his advice. At first these greens appear benign, but in fact they are very subtle and subsequently a challenge to read. From the tee boxes , the generous fairways and landing areas make the holes appear easy, but once you approach the green you have plenty of bunkers to contend with (over 200 on both courses) thats an average of nearly 6 bunkers per hole. Prospector was running firm and in excellent shape, and sitting at the foot of the Superstition Mountains, its in a beautiful setting. There are 3 drivable par fours (10,14 and 15 and each presents a very different challenge. We never saw water on the course until we encountered a pond that runs the length of the par 5 eighteenth hole. It could be very calming conclusion to your round or a very frustrating one, depending on whether your ball is anxious to go for a swim. Prospector has hosted “The Tradition”, several years of the LPGA tour, and the Arizona Open more than once. Prospector plays 7225 yards from the tips and down to 5223 from the front. so its fun for all.